Clinic Synopsis: This clinic will help band directors get the most out of their saxophone section. We have identified eight common challenges that saxophonists of all levels deal with daily, and we have the solutions to help remedy these issues. Presented by United States Navy Band saxophonists MU1 Jonathan Yanik and MU1 Dana Booher, teachers of all levels will have something to gain in helping their saxophone sections reach their full potential. 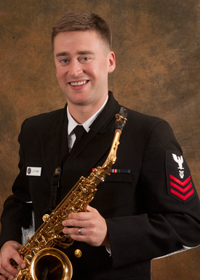 Clinician Biographical Information Musician 1st Class Jonathan Yanik, a native of Simsbury, Conn., joined the Navy Band in April 2009 and was selected as principal saxophonist in 2011. He earned his Master of Music in saxophone from the University of Michigan in 2008 and earned his Bachelor of Music Education with high distinction from Indiana University in 2007. Before joining the Navy Band, Yanik worked as a musician in the Queen’s Room Orchestra, playing jazz, dance band, and popular styles aboard Cunard Cruise Line’s Queen Victoria. He has also been successful in competitions, most notably winning the grand prize in the Heida Hermanns International Woodwind Competition. A proponent of Music Education, Yanik was the adjunct professor of saxophone at Towson University from 2011-2013 and has been featured clinician, teacher and guest artist at colleges, universities and high schools across the country. 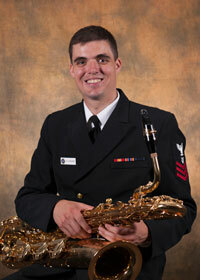 Second Clinician Biographical Information Musician 1st Class Dana Booher, a native of Costa Mesa, Calif., joined the Navy Band in August 2011. He earned Bachelor of Music and Master of Music from Indiana University, studying with Otis Murphy. Booher is a recipient of the Indiana University Performer’s Certificate, the highest honor that can be awarded at the institution. Booher has won top prizes at competitions including the Carmel Music Society Competition and the North American Saxophone Alliance Competition. He has performed with the Washington National Opera, National Symphony Orchestra and baritone saxophone for the Zzyzx Saxophone Quartet, a group of high regard. Booher previously served as adjunct professor of woodwinds at Vincennes University in Vincennes, Ind., and associate instructor of saxophone at Indiana University.